Set, lighting and video designer Luc Peumans, of Painting With Light struck this evocative chord for the iconic ice show with help from a collection of 16 Geyser RGB LED effect foggers from CHAUVET DJ. The theme of the 2015 European Holiday On Ice Passion pulls back the curtain to offer a behind the scenes look at the long and magical journey that world class skaters make from obscurity to stardom. It is the dream-come-through stuff that legends are made of; and what better way to accent the ethereal nature of this fantastic tale than by enveloping the skaters with colorful puffs of clouds. Set, lighting and video designer Luc Peumans, of Painting With Light struck this evocative chord for the iconic ice show with help from a collection of 16 Geyser RGB LED effect foggers from CHAUVET DJ. Painting With Light, which produced the complete creative concept - encompassing lighting, set and video - for the 70-year-old ice show used 16 of the Geyser units. The foggers were positioned at the perimeter of the 40 x 20-metre rink and overhead on trussing to lend added drama to the skaters’ entrance and to accent dramatic moments in their routines. The Geyser RGB uses 21 high output 3-watt RGB LEDs to illuminate columns of safe water based fog that shoot from the machine. Peumans took full advantage of the fixture’s capabilities to add an extra rich visual element to the show. 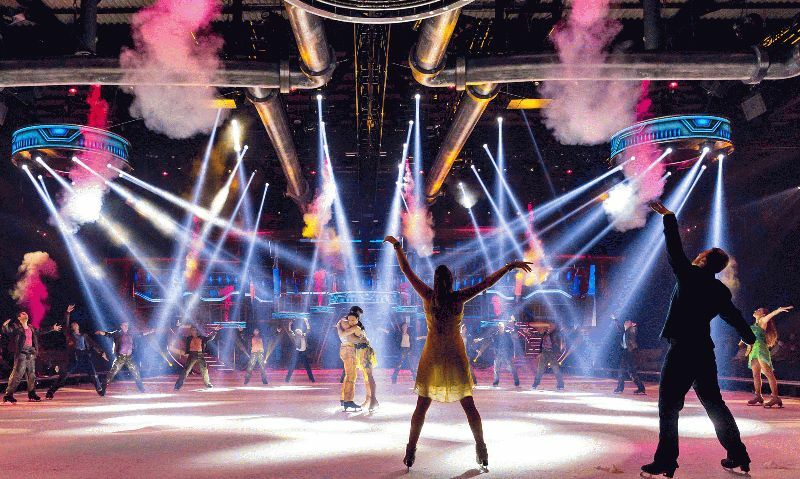 The main ice ‘stage’ lighting design uses multiple profile and beam fixtures for numerous mid-air effects; eye-candy and color wash over the performers. The atmospheric effects to accompany the ice skaters, however, were greatly aided by the colorful fog from the Geysers.